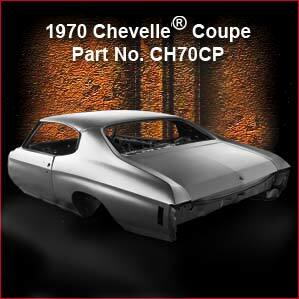 You are here: Home » Rob's Blog » The best time ever to be a muscle car guy….or gal! 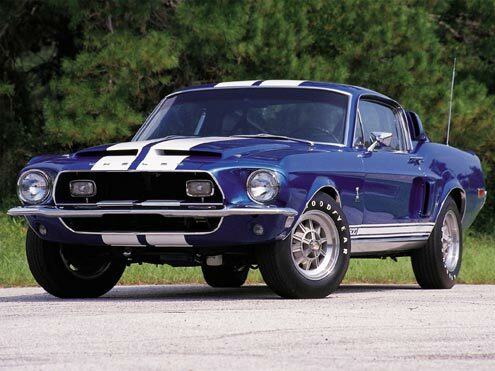 The best time ever to be a muscle car guy….or gal! I have the chance to interact with a lot of fans of American Muscle cars on a regular basis. I also speak with a lot of people in the automotive and restoration industry as well as those that sell classic cars for a living. Everyone seems to whole heartedly agree – there has NEVER been a better time to be a muscle car guy…or gal! 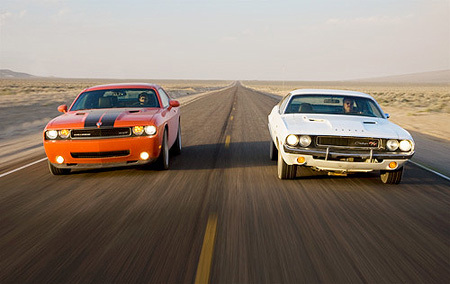 Two cool Challengers only 40 years apart in age. Photo courtesy Edmunds.com. The year 2009 has had many highs and lows, but it seems that the wonderful world of muscle cars has nothing but positive things going for it. Whether you prefer old muscle cars or new ones, restoration projects or hot rodding projects, or just like investing in some of the best Detroit Iron ever made, 2009 has offered you absolutely everything you could ask for. Let’s review a few highlights! The Big 3. Photo courtesy msn.com. Perhaps you prefer a new – old – car? No problem. Order a Dyacorn replacement body for your favorite GM or Ford muscle car and start wrenching. If you’re restoring an old muscle car, or hot rodding one, nearly everything you need to get the job done can be delivered in a box to your front door. Year One recently started producing the long awaited 1968 and 1969 Charger taillight panels along with brand new 1970 ‘Cude grilles. Until now, things like these had to be hand repaired out of multiple donor parts! GM E-Rod LS3 engine. Photo courtesy StreetLegalTV.com. If you’re a traditionalist and want to keep the the old muscle cars the way they were born, you’re not alone….and your options to get one are plentiful. Barrett Jackson and Mecum are offering some of the finest auctions around to purchase any muscle car you’ve ever dreamed off. The dealers that advertise here at The MuscleCar Place have the finest inventory available anywhere – and they’d love nothing more than to prove it to you. Whatever your price range or intention for your car is, you’re covered! Quite honestly, if you’re into muscle cars, the world is your oyster right now. New, old, resto, original, hot-rodded, etc. – it’s all out there for you. Better yet, tomorrow is looking even better! Stay tuned, and prepare to burn a lot of gas – and a lot more rubber!